‘Do you know who Sargrenti was? That was the name I gave to Major General Sir Garnet Wolseley, KCMG, Commander of the British Queen Victoria’s Army which invaded Asante and sacked its capital, Kumase, in 1874, 21 years ago. Here he is, with his waxed moustache and medals’. These are the opening sentences of The Boy Who Spat in Sargrenti’s Eye, discounting the ‘Author’s Note’ which precedes them. The author’s note is itself a part of this fictionalised retelling of one of the five conflicts that are together known as the Anglo-Ashanti Wars, specifically the Third Anglo-Ashanti War, also known as The First Ashanti Expedition. The story is set in the Gold Coast (present-day Ghana), which consisted of the domains of major tribes: the Asantes, the Fantes, the Elmina people, and other tribes like the Komendas. Told in a ‘diarised’ style by the protagonist, Kofi Gyan, aka Coffee John, it joins the ranks of other works such as Biyi Bandele’s Burma Boy and Rotimi Babatunde’s ‘Bombay’s Republic’. It is particularly similar to Burma Boy in that the main characters of both books are teenage boys with romanticised views of war as adventure, and they are both rudely shocked out of their folly. All three works highlight race tensions between Caucasians and their Negroid ‘underlings’. Kofi Gyan is a 14-year-old, Elmina boy. He is royalty by virtue of being a nephew to the Ohin of the Elmina people. In 1872, he is being a boy and doing the things that boys do, frolicking on the beach, making fun of the white folk that wash up ashore and charging them money to carry their goods. His idyllic existence is however about to be disrupted: the Dutch, with whom they have peacefully co-existed for many years, and the British are negotiating the exchange of Elmina lands, which they have no right to except the brazen impunity that characterised the parcelling of much of Africa in colonial times. The Elmina people – together with their good friends, the Asantes from Kumase – stand up to the British but are no match for their superior firepower. 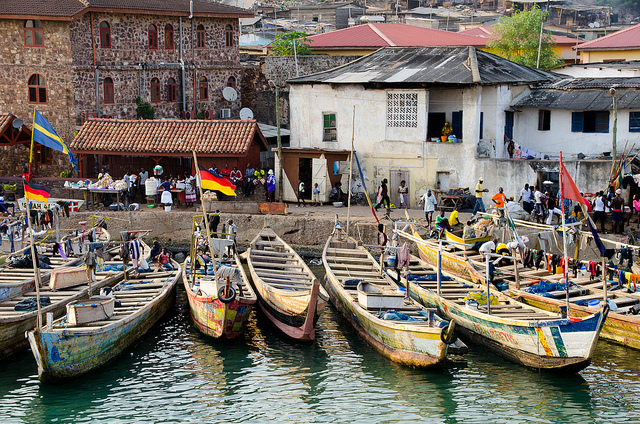 Elmina is left in smouldering ruins and her people flee to Cape Coast, the home of the Fantes. In Cape Coast, Kofi lives in the house of his maternal grandfather, Grandpa Christian, an astute businessman who is taking in white men as boarders, to supplement the family income. His boarders are two British and one American journalist who have come to cover the impending war between the British and the Asantes. These characters are portrayals of real-life people who were actually present during that war. One of them is Mr Melton Prior, an artist for The Illustrated London News. It is he who employs Kofi (Coffee) as an assistant, to look after his art supplies while he renders pictorial accounts of the war. At first, Kofi’s parents are loath to agree, but are eventually convinced that he would be useful as a spy for the Asante king. Thus, Kofi follows the war and observes it from the British side, in all its brutality. He witnesses the harsh treatment of porters – black men – and their reduction to a status little better than beasts of burden. He sees the action of Gatling guns and counts corpses and skeletons in vanquished villages. He also sees the coming of early wonders such as the distillery for purifying water and the installation of telegraph lines. In the end, the destruction of Kumase and the looting of the Asantehene’s palace are too much for him to bear. Kofi returns to Cape Coast about three months after leaving, a different boy from the one who left. At the British-engineered auction in Cape Coast, where the objects stolen from the Asantehene’s palace are sold, he spits in the eye of Sargrenti, Commander of the British Queen Victoria’s Army. Here, the reader is somewhat disappointed, for an event from which the book takes its title, the spitting in Sargrenti’s eye is a scant paragraph that the writer quickly offloads like a burdensome weight and then walks away from, very quickly. In telling this story, Herbstein does a good job of bringing to the consciousness of his readers certain historical truths, disguised as fiction. He tells the story of the hunt as the lion’s storyteller – a telling that does not glorify the hunter. It provides a counterpoint to the largely prejudiced European accounts of that period in history. He unapologetically calls out the real-life Caucasians portrayed in the book as bigots and racists. The racism described in these pages cannot be wished away. Perhaps it – and all the similar tales that abound, from Cape Coast to Cairo – can be regarded as pointer to the solid foundation upon which blatant racism is firmly built, in yesterday’s Selma and today’s Ferguson. It is also the story of resilience, of a people’s attempt at resisting colonial superpowers, and their eventual defeat. The novel is rendered in simple English, making it easily accessible to readers of all ages. This book is particularly important for young readers, for whom history is becoming a receding horizon. Its beautiful illustrations – reproductions of actual pictures from various sources – provide the reader with a visual connection to the events that took place. One can almost hear the crashing waves on the beach and smell the fear of the fleeing refugees. The reader comes away with the feeling of having read a well-researched and well-written novel. Agatha Aduro is a medical doctor by day and literary doctor every time else. A writer across the genres, her writings have appeared in different online magazines, anthologies and in print. She lives in Minna, Niger State, with family and two lovely dogs. She blogs at lifeandtheotherhalf.wordpress.com, Twitter: @pixiedust318.